This is a fantastic way to add flavour to rice and cook the vegetables at the same time. Place the rice in a sieve and rinse thoroughly in cold water. Then place in a large pan with the sliced leeks, lime, star anise, garlic cloves and fresh ginger. Cover with 900ml of cold water. 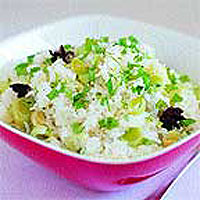 Bring to the boil, cover and simmer on a low heat for 10-12 minutes until the rice is cooked and the leeks are tender. Do not remove the lid during cooking as you will release all the steam. Remove and discard the ginger and garlic, then season, sprinkle with chopped coriander and serve. You could serve 2 x 350g packs ready-made Waitrose Thai Fragrant Rice, garnished with chopped coriander and thin slices of salad onion.